We transform individuals into champions in exploiting european funds. Unlike others that focus on theory and basic stuff, we focus on results! Get this distinct step-by-step, start-from-scratch approach for financially managing european funded projects. NEVER be JOBLESS again by mastering from the best expert how to manage financially and apply an audit proof approach for funded projects. Get the most comprehensive, detailed course on the development of Erasmus+, KA2 collaborative projects. The course is based on the step-by-step FETP™ recipe and instructs you how to master this course and impress the evaluators with the proposal quality. Funding Expert Academy Student Workbook as well as the Resources Folder are very valuable for anyone interested in being successful in European funding with a fraction of the effort applied by other winning applicants. 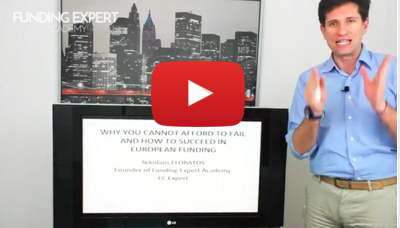 ​The Membership programme of Funding Expert Academy includes Nikolaos Floratos’ monthly training series on how to build a career as a highly paid funding expert. Check the upto date monthly video sessions at this page.